Cheap Textbooks are finally at your fingertips. 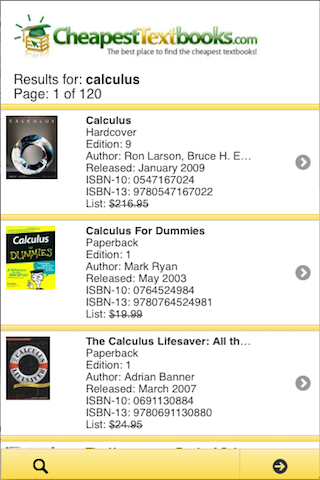 Find the Cheapest Price for your college textbooks with this FREE app. Harness the power of CheapestTextbooks.com on your Android and iPhone today. At CheapestTextbooks.com, we believe that college students shouldn't have to pay full price for their textbooks. For over 10 years, we have striven to build the fastest and most accurate textbook comparison website out there. And now, we've brought the power of that same website to your mobile phone. The rental option even covers various lengths of time, so you can find the right rental program for your specific school term length. At the end of term, when you are ready to sell your books, we'll help you find the highest price, so you know you are making the best deal possible. Every dollar and every minute is precious. Don't waste them. 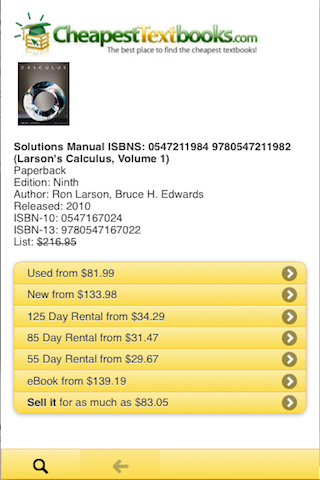 Use the CheapestTextbooks.com app to save you time and money.